I've made a family recipe for a bunch of my genealogy friends lately and thought I would share it with you. This recipe is from my Mother's Mother's Mother's Mother-- my great-great grandmother Ethel Amelia Williams. The fact that she was born in Salt Lake City, Utah 15 Feb 1880, and died there in 23 Mar 1973 is deceptive. She lived most of her life in Idaho--specifically Idaho Falls. Her husband Fred Schwendiman was born 28 Jul 1872 in Niederstocken, Bern, Switzerland. I've always thought this was a Swiss recipe since it was from "Grandma Schwendiman" but Mom informs me today that while it could have come from her Swiss mother-in-law, Ethel was also very creative herself, or she could have just found it in a newspaper. Mom doesn't really know. But I do know that she often made them. I have this one picture of me with Grandma Schwendiman. She is on the left. 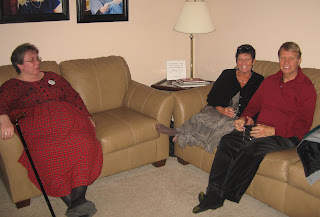 Me and Mom are in the middle, and my Grandmother Dana (Grandma Schwendiman's granddaughter) is on the right. 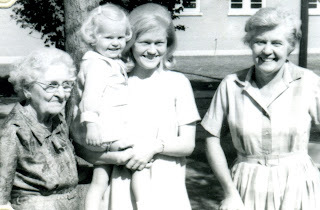 Unfortunately, Grandmother Dana's mother Nama (Viola) wasn't here for this picture even though she was alive. I would have had a five generation picture. Can't complain though. Happy to have this one. Mix together and cook like pancakes on a hot griddle. Mom says I can't share Grandma Schwendiman's recipe for egg cake, chili sauce or honey candy because they are family secrets. Grandma Schwendiman and Nama left strict instructions that they were not to be shared outside the family. Mom says that in those days a woman's identity was wrapped up in how good of cook they were and these women wanted to secure a great identity for their daughters I guess. Being the daughter of two home economics teachers (Mom and my Dad's mother) I've never worried about being a good cook. But I have a couple of recipies to fall back on just in case. You won't see them on this blog. You'll have to come visit. Let me know when you are coming and I'll have some ready for you. A great companion to my New FamilySearch rants. Ok. As fast as it seems life is moving now, this is terribly old-fashioned of me, but I have a list of books for you. Sometimes I just feel like unplugging and cuddling up with a book. Campbell, Starr Hailey. The Adventures of James Series: A Trip to the Cemetery, A Trip to the Oncologist, Baby Sarah is born. Creative Continuum; Anaheim CA, 2005 and 2006. Rice, Chris and Melanie Rice. How Children Lived: A First Book of History. Dorling Kindersley; New York, 1995. Horowitz, Lois. Dozens of Cousins. Ten Speed Press; Berkley, 1999. Perl, Lila. The Great Ancestor Hunt: The Fun of Finding Out Who You Are. Clarion Books: New York, 1989. Oryx American Family Tree Series. Brockman, Terra. A student's guide to Italian American Genealogy. Oryx Press: Phoenix, 1996. Paddock, Lisa. A student's guide to Scandinavian Genealogy. Oryx Press: Phoenix, 1996. Robl, Gregory. A student's guide to German American Genealogy. Oryx Press: Phoenix, 1996. Schleifer, Jay. A student's guide to Jewish American Genealogy. Oryx Press: Phoenix, 1996. McKenna, Erin. A student's guide to Irish American Genealogy. Oryx Press: Phoenix, 1996. Ryskamp, George. A student's guide to Mexican American Genealogy. Oryx Press: Phoenix, 1996. Kavasch, E. Barrie. A student's guide to Native American Genealogy. Oryx Press: Phoenix, 1996. Johnson, Anne E. A student's guide to British American Genealogy. Oryx Press: Phoenix, 1996. And just in case you still need an electronic fix-- one great weblink. SPRINGVILLE, Utah. — March 30, 2009 — RootsMagic, Inc. announced the immediate availability of an update to their RootsMagic 4 genealogy software which is now FamilySearch certified for both temple ordinance reservation and temple trips. RootsMagic 4 is the first- and currently the only- desktop genealogy software to offer these features and certifications. As an “Ordinance Reservation Certified” application, RootsMagic 4 has the ability to link people in your desktop genealogy file with matching people on the New FamilySearch website. Once linked, RootsMagic 4 makes it easy to share data between your personal file and New FamilySearch. By simply clicking on the temple icon next to a person’s name, you are shown that person's official temple ordinances, complete with dates, temple names, and status. You may then reserve any incomplete ordinances that you wish to perform in the future or update your own file with ordinances which are already completed. As a “Temple Trip Certified” application, RootsMagic 4 can create “Temple Trips” from any ordinances which you previously reserved through New FamilySearch. You select which reserved ordinances you wish to print ordinance cards for and RootsMagic will print a paper with a barcode on it known as a Family Ordinance Request (FOR). You simply take the paper to the temple and a worker will scan the barcode, printing off all the desired ordinance cards. Once the ordinances are completed, RootsMagic will update their status in your personal file. RootsMagic also simplifies other tasks when working with New FamilySearch. Recently, RootsMagic 4 received awards for “Easiest to Sync” and “Best Dashboard” at the 2009 FamilySearch Developer Awards. Video tutorials, demonstrating how easy it is to work with New FamilySearch using RootsMagic 4 are available at http://www.rootsmagic.com/fs. A free trial version of RootsMagic 4 is available at http://www.rootsmagic.com. The trial version allows a person to import their data, add information, and play with RootsMagic’s major features without any time limitation. “We’re so excited about this new release, we wanted to give everyone a risk-free option to try it for themselves,” said Buzbee. Users of other genealogy software products will find it easy to experiment with RootsMagic 4 using their own data. RootsMagic can directly import data from PAF, Family Tree Maker (through 2006), Family Origins, and Legacy Family Tree. It can also read data using the popular GEDCOM format. For more information, visit http://www.rootsmagic.com. SPRINGVILLE, Utah. — March 25, 2009 — RootsMagic, Inc. today announced the official release of RootsMagic 4, the latest version of the award-winning genealogy software which makes researching, organizing, and sharing your family history easy and enjoyable. With the release comes a free trial version of the software as well as a discount offer for owners of other software products. RootsMagic 4 boasts an impressive list of new features including integrated web search, improved SourceWizard for citing sources, sharing events among multiple persons, creating pre-defined groups of persons, person and place mapping, recording DNA tests, and improved navigation and data entry. RootsMagic 4 is also one of the only desktop genealogy programs certified to work with “New FamilySearch”. A free trial version of RootsMagic 4 is available at http://www.rootsmagic.com. The trial version allows a person to import their data, add information, and play with RootsMagic's major features without any time limitation. “We’re so excited about this new release, we wanted to give everyone a risk-free option to try it for themselves,” said Buzbee. RootsMagic 4 is available for only $29.95. Existing RootsMagic and Family Origins users may upgrade for only $19.95. For the first time in company history, users of other genealogy software programs can receive a competitive upgrade discount. Through May 31, 2009, users of Personal Ancestral File (PAF), Family Tree Maker, Legacy Family Tree, or The Master Genealogist may purchase RootsMagic 4 for only $19.95, saving $10 off of the regular price. More information about the competitive upgrade can be found at http://www.rootsmagic.com/upgrade. Try a cabinet style computer desk, or a folding screen to take over a corner of the family room. Move to a climate where you can eat on the patio. Kick a kid out of their bedroom. Well it has been one year today. My friends on facebook think the celebration should include chocolate or going out to dinner. (Let me know when you figure out how to post it to the internet guys.) On twitter we have been talking about microwaving marshmallow peeps. Hmm. I don't think my husband in the next room realizes its the blogversary. He never reads it. He's busy working. I think, in lieu of celebrations, I'm feeling reflective. Some of the posts people talk to me about most were right in the beginning. Will your work survive the digital age? I'd like to do alot more with this blog in the next year. 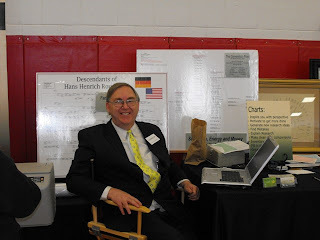 I'll try to bring you more good information about genealogy and the industry. I'd like to get in more entries to carnivals. I think they are fun. If you have any other suggestions I'd love to hear them. It is amazing what this last year has brought. I wonder what the next year is going to bring. 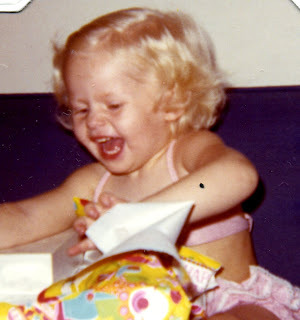 I think the blog has been a little like family history for me. A good outlet. Nice hobby. Helping me discover more about who I am and where I'm headed. Hope it has some good ideas and information for you too. I appreciate you reading. Slowly but surely (and long). And I have a few pictures for you. The South Davis Family History Fair is a wonderful fair put on by the South Davis Regional Family History Center. 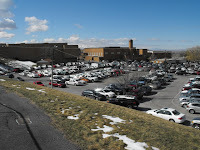 It is held at Bountiful High School in Bountiful Utah. They pack alot into one Saturday there. It is estimated that they had 1,763 people there on the 7th. They have five class periods with 18 classes a period for a total of 90 classes. It is basically a three day conference all packed together into 8 hours. Because it is put on by volunteers, the classes are free and the cost for a syllabus and sack lunch is only $10. It is an amazing volunteer effort headed by Donna Smith, Leonard Plazier, and Terry Carlson with many, many others. Congratulations to them on another great fair. Then I also taught my new "Certified Genealogy Software that Makes New FamilySearch Easier" class. Mike Booth (RootsMagic) came in for tech support on that class (thanks Mike!) and we were both amazed at the crowd that class attracted. They are a different crowd than the regular class attendees for the software classes. I hope that I helped them to start moving into the new era of genealogy and in possibly choosing a new software to try. Bruce Buzbee and Mike Booth (RootsMagic) got the Best Dashboard, and Easiest to Sync award. Gaylon Findlay (Ancestral Quest) got the Best Listing Tool and Most Comprehensive Sync award. And John and Paula Vilburn (Ohana Software) got the Best Standardizer and Best Person Separator award. We print and are partners with all of the above. We encourage you to go check out their products. 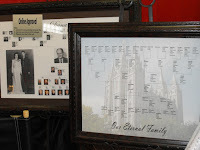 You can get all the info on the awards at the FamilySearch link. Then we were on to the BYU Computerized Genealogy Conference last weekend. I again taught "Certified Genealogy Software that Makes New FamilySearch Easier" and again was surprised at the people that class attracted. And I also taught my "Genealogy Charts to Help Your Research" We had a wonderful get together Friday night and talked late into the night about all sorts of things. (Don't worry Gordon your childhood secret identity is safe with me.) I do love the conference groupies that we get to hang out with. L-R: Mike Booth (RootsMagic) Gordon Clarke (FamilySearch) John and Paula Vilburn (Family Insight) Luc Comeau (Legacy) Bruce Buzbee (RootsMagic) Barbara Renick (Speaker Extraordinare) Kim . L-R: June Booth, Gordon Booth, Haybron Adams, Leonard Plazier. Renee Zamora (Renee's Genealogy Blog) and Peggy and Paul Larsen (Crash Course in Genealogy) Sorry for the people I missed in the pictures. I swear I'm going to take more pictures. Thanks you guys. Miss you already. See you again soon. Seeing as how my sister announced last week that she is getting married September 3rd in Maui, we will not be going to Little Rock for the FGS conference. (Luckily we were still debating) I have three unmarried sisters, two of which are getting married this summer. I was laying odds that they would pick a conference weekend--so far I'm 1 and 1. Anyone want to lay odds on which conference my last sister will cancel out? We'll be thinking about you FGS'ers while we are in Maui. Well, ...maybe. We'll be making family history. And getting in a little laying on the beach I'm sure. I have always said I learn more from the vendor's hall than I do from the classes at conferences. But I went into the last three conferences hoping to slip into a few classes to review here on my blog. I only got to one so far, however I'm going to keep trying. We are glad our vendor's booth has been so busy and my own teaching keeps me running too. It would probably help if I wasn't talking so much with the attendees and other speakers and lecturers but it is just too much fun to catch up with everyone. I did get to catch Barry Ewell's class "Internet Security for the Genealogist" at the St. George Expo. Barry is a celebrity around here not only for his great classes but also because he so generously shares his knowledge and powerpoint slides. If you send a message to: bj57barry@msn.com and put in the subject line: "St.George_Send All" he will send you the .pdfs of all his powerpoint slides for his three lectures in St. George--1) Million Dollar Genealogy on a Slim-Pickens Budget, 2) How to Effectively Conduct Genealogy Research on the Internet, and 3) Internet Security for the Genealogist. Barry really likes Google Chrome and Mozilla Firefox. After my recent computer breakdown, I downloaded Firefox and I am quite loving it. Lots less glitches and it seems faster. I like the interface a little better too. Barry also said to stay away from Norton Utilities--it has a large footprint (takes up too much memory) on your computer and often conflicts with other software. He likes the McAffee suite, Kaspersky suite, and WebRoot that you can get for $30 a year. Well worth it to protect yourself. He recommended the Internet Security Suites Software Review to check out which one is right for you. He also reminded me to hit ctrl-W (or on an apple command-W) to close pop up windows. If you click on the x in the top right corner, it can still take that as a response and download something to your computer. When you guard yourself against malicious internet problems, you end up guarding everyone else you work with too. Don't be the person to pass it on. There were lots of other suggestions in his lecture that you might need reminding of--write Barry for his slides to make sure you are following good internet protocol for protecting your computer and your files. Barry is also in the process of launching mygenshare.com, a website devoted to "learning, sharing, contemplating, collaboration or simply enjoying genealogy." It looks like it will be a great place to go for training. I'm looking forward to seeing what he has in store. You can sign up for his newsletter there so that you can be informed on what is coming. My opinion. For what it is worth. I asked Ransom Love today about how the LDS church sees the growing FamilySearch PR problem that we are continually seeing at the conferences we go to. In our experience, people who are not members of the LDS church are growing tired of hearing about this new database without any word about when they will be able to gain access to it. I think to some, it seems to be an elusive, secretive thing from which the church is purposely trying to exclude people. While I didn't get any solid answers from Ransom on why (we got sidetracked on to other things), I can tell you from my experience in working with the church that it isn't a matter of being exclusionary, it is just that the church is putting their resources first into their own agenda, that of helping their own members collect their family history. Once that is accomplished, they will be happy to share the results. I think anyone would agree that an organization has the right to use their resources to further their own agenda first. The bad news is: what that timeline is and what issues have to be fixed before people outside the members of the church can access to the database. He referred my question about the timeline to Craig Miller. According to Craig, after the database is scaled to be able to handle the traffic and information for the last part of North America (Utah, Idaho, LasVegas etc. ), then the next step for them is going to be to include members of the church in Asia. I can understand that they want to take care of their agenda first, and that includes family history work in Asia, but according to Craig there are HUGE obstacles, namely standardization and searching in Asian characters. You can't just anglicize different character sets and expect to be able to search it. (For example how many ways can you spell Kadaffi, Quadafhi, Gadaffi, etc--you know, the leader of Lybia--and Arabic only has 28 basic letters.) Craig said that in the past Japanese citations in LDS databases have actually been standardized to all be Tokyo (horrors!) Dealing with Asian character sets is going to be a big obstacle to get over before they move on to opening the database to people outside the church. Ransom agreed that there needed to be some marketing work done in the general genealogy community as to why the church is keeping access only for its members. I wholeheartedly agree. I don't think they are trying to be secretive or subversive, I just think they aren't communicating their objectives very well. I would also suggest that making the database read only for everyone would be a simple step and should be done as soon as possible. The good news is that Robert Raymond's presentation today was very hopeful in talking about adding sources to the database. He is working on standards for source citations in the database--a major issue that I have talked about here. As you look around, most genealogy programs have a list of sources--and then let you add citation information as to the particular part of the source you are referencing. In the real world though, all of the source information is important detail. The line between sources and citation detail is a false one--created by the software companies to allow users easier creation of citations and querying the usage of a certain source. New FamilySearch is working on standards to help guide that usage in the database. The major issue to the church is not just standardization, but also the question of migration of sources. If they open the database to www links, or even notes on repository locations, we will have a useless database in only a few years. That is not to mention the fact that many sources cite another source as an original that can then cite another ad infinitum. Sources citing other sources creates circular sources the way we see many circular trees in files that are submitted to Generation Maps which have been generated from databases. Tom Underhill raised his hand at the end of the presentation and talked about the importance of migration and how the only way to secure data is to make sure it migrates on to the next system like I've talked about here. Otherwise you end up having documents in WordStar and Word Perfect 2.0 that are useless. Talking to Robert after the presentation, he said that we would see some real progress in the next year for adding sources to the database. It looked like they are on their way. Wonderful news. In my opinion, only then will this database really become valuable. So, frankly people who aren't members of the LDS church don't need to be worried about gaining access to the database until the source issues are solved anyway. Until then it is all conjecture. Only when sources are added will the database become more useful. Real genealogists have plenty to be patient about. WEB USE OF MEDIA CATEGORY: Best Website Feature for Printing Award. By simply typing in your New FamilySearch username and password, Generation Maps can take data from the new database to print any kind of decorative or working genealogy chart. The award highlights our work in making navigation of the database easier by printing the big picture of the data—off the screen and out where it is all visible. Early users are really excited to see the extensive data from the database in one piece. One lady said she thought she had been the only person working on her Eastern European lines, and was thrilled to find other cousins to collaborate with, and to be able to see exactly what they had done and compare it to her work. New FamilySearch is built to encourage collaboration. On each of your ancestors, you are able to see what other people have added about that person. While the system is still being rolled out, and has lots of improvements in the works, it promises to bring a whole new level of collaboration to family history work. Several years ago Generation Maps was asked with 6 other companies to become one of the LDS church's early commercial affiliates and to develop products to work with the new database that will eventually replace FamilySearch. We have since become one of the first certified affiliates. (http://www.familysearch.org/eng/affiliates/index.html). As we sat in the development meetings, we tried to come up with ways that Generation Maps could help the user navigate that database. We focused on getting things out and off the screen to be able to see the big picture--something we do best. Overall, Generation Maps continues to be your one-stop, easy to use, very affordable source for all kinds and sizes of genealogy charts—all of these available with new FamilySearch data or any easily uploaded genealogy file. Inexpensive, expansive charts designed to display many generations of data all on one chart. Perfect for assisting your research, family reunion displays, etc. Designed to help you navigate the information, then efficiently analyze, organize and clean up the data found in the new program. Beautiful handcrafted, decorative charts for framing. Select from various backgrounds, fonts and embellishments; add photographs, include step families or other relationships, then create exactly what you want. Generation Maps individually handcrafts each chart, giving personal attention to quality and detail. With decorative charts, the user will receive a website link to your chart via email so you can approve your creation before it is printed. There is no software to purchase, no program to learn, and no need to search for an over-sized, professional, archival printer. Extra copies of any personalized genealogy chart are half-price, making them perfect for gift giving. Gift certificates are also available. Generation Maps helps you surround your family with a sense of their heritage and charts are a wonderful, easy way to explain to your family members the research that has been accomplished. With Generation Maps, it's easy — just pick out your chart, upload your files, and it arrives on your doorstep! 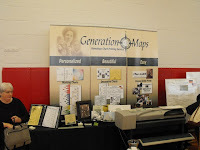 Generation Maps (http://www.generationmaps.com/) is the place to come for all your genealogical chart printing needs. RootsMagic To Go--never done before in any other software--you can run the full software off a jump drive so that you can take it anywhere. So handy. Shareable Events so that when you have entered the data and sources for one person, you just one-click it all to anyone else that was there. Shareable CDs that run on their own when you send a copy of your database to family members. They don't have to have any software or downloads to look at your data. Ok, not new but cool. FamilySearch Central screen that allows you to get a birds eye view of what you have linked to the new database and what has changed. Unicode support for other languages to keep the accuracy on all my foreign ancestors. They didn't all speak English. Source Templates with BCG standards and the ability to create new templates because it seems like every genealogical source has something strange about it. Lite and Fast processing so that it doesn't take over your computer. Bruce and Mike have worked really hard on this. The New FamilySearch interaction speed is amazing. Easy-on-the-eyes Clean Screens and soft colors that I really like. Incredibly nice guys who program it. What more can I say? Check out the RootsMagic blog for whole low-down on all the new features. SPRINGVILLE, Utah. — March 4, 2009 — RootsMagic, Inc. today announced RootsMagic 4 public beta, the latest version of the award-winning genealogy software which makes researching, organizing, and sharing your family history easy and enjoyable. During the public beta period, all are invited to download and experience the software, free of charge. RootsMagic 4 beta is available now for free at http://www.rootsmagic.com/preview. “We’re so excited about this new release, we wanted to give everyone a risk-free option to try it for themselves,” said Buzbee. Each person who wishes to participate will be given a registration key which will allow them to download and experience the software for the duration of the public beta period. Users of other genealogy software products will find it easy to experiment with RootsMagic 4 using their own data. RootsMagic can directly import data from PAF, Family Tree Maker (through 2006), Family Origins, and Legacy Family Tree. It can also read and write data using the popular GEDCOM format. For more information, visit www.rootsmagic.com . Another company you might be interested in that we saw again in the St.George Family history expo is Family Pursuit. They have been showing their demos and beta at the conferences for a couple of years, but have just begun to actually roll out their product. Mike Martineau and Les Eldredge et al. have created a "online, wiki-based family tree database" that allows users to upload private family trees to a collaborative website on either a community basis where you can work with other genealogists, or a private basis where family members from advanced to novice can work together on the family genealogy. I'm most intrigued by the private trees that promise to be a place for family discussions and social networking where family members can mentor each other, divide up and assign tasks, and keep and share reasearch logs together. You can add source citations and upload images to support findings. And you can share audio and video files to further flesh out the family stories. They say that "wiki-based merge/unmerge and undo/redo tools provide a fail-safe platform for true collaboration." (and possibly a good old-fashioned family fight? depending on your family :-) The idea of being able to work with other family members in a safe online system will certainly appeal to many genealogists and it looks like they have already worked out some of the collaboration issues that still need to be addressed in the New (albeit larger) FamilySearch system. They are also under development as an affiliate of New FamilySearch. When Family Pursuit is able to link with FamilySearch, it will bring one family member's link with FamilySearch into the collaborative environment where the rest of the family can work on the information there, looking for duplicates, submitting new information and receiving updates when changes are made on NFS. Mike said in St. George that they are still working out some of the issues with NFS and their web based environment but hopes to have the synchronization working soon. What if you could facebook with your ancestors?